Consider the amazing hadeeth, “Part and parcel of right and good worship of a person is his good thought” (Al Jame’a Al Sagheer). And the Prophet (pbuh) has also said, “Had they had good thoughts, indeed they would have had good actions.” These two hadeeth demonstrate the foundational importance of good thoughts. Isn’t it therefore imperative to become aware of our inner thoughts, the dialogue that courses though our minds all day long? Is it possible that we have negative thoughts that we are only marginally conscious of, that keep us imprisoned in a troubled or weakened self-concept, with habits of behavior that only bring us misery? Negative thoughts are often expressed as self-limiting beliefs that keep us from deeper discovery of who we are and how to embark on paths of growth in maturity and spiritual upliftment in our daily lives. To understand how an individual can allow dysfunctional and damaging thoughts to keep him shackled and resigned, consider elephants. These incredibly strong animals can be controlled and used for manual labor if they are conditioned while still young. The elephant’s leg is tied to a stake in the ground with a thick rope so that it can move only a few feet. At first the young elephant will attempt to pull free from the stake and rope, but over time, after numerous attempts, he gives up and accepts his captivity. Even when full-grown, with more than enough strength to break free from the stake and rope, the elephant is conditioned to believe that he cannot escape. The elephant could walk away at any time, but his conditioning, like our self-limiting thoughts, keeps him captive for the rest of his life. Self-limiting beliefs are often established early in life. Imagine a child in 3rd grade who is a slow learner. It appears to him that he doesn’t learn things as easily as the other children. He repeats countless times to himself, “I am stupid.” And he might reach adulthood actually believing he is stupid, even though that might be far from the reality. Intellectual capacity and individual modes of learning are two different things. But he couldn’t know that as a child. So unless a parent or teacher or counselor intervened, he would internalize that self-concept of being stupid. The sad thing about self-limiting beliefs is that it is like wearing blinders — the pair of leather flaps attached to a horse’s bridle to cut off his side vision. We tend to focus on the things in front of us that conform to and reinforce our self-concept. We become experts at finding the evidence in our experience to support our self-limiting beliefs and ignoring anything to the contrary. And then our negative self-talk seals the deal with things like, “That always happens to me.” “See, I’m no good at that sort of thing. I knew that was going to happen.” The RAS and our limiting self-talk form a seeming comfort zone. But it is an illusion. The reality is we are flailing about, without taking charge of our lives, like being adrift at sea, tossed around by powerful waves. For some people the idea of taking an inventory of their thoughts in order to discover negative or disempowering ideations or self-limiting beliefs is just too much of a struggle. Or that the struggle will never bring about a positive outcome. But we now know that this too is just self-limiting belief. Re-framing that perspective on struggle with an empowering frame of reference can be a springboard to transformation of self. A powerful reference about struggle is found in the following parable. A man found a cocoon, the silky enclosure spun by the larvae of many insects, to serve as a covering while they are in the pupal stage. This was the cocoon of a butterfly and the man decided to watch and witness the gradual emergence of the beautiful insect. One day he noticed a small opening had appeared. The man watched for several hours as the butterfly struggled to push itself through the small hole. When it seemed that the butterfly no longer was making any progress, the man decided to help it by carefully making a slit in the cocoon with a scissors. The butterfly emerged easily, but its body was swollen and its wings small and unextended. The man watched, waiting for the body to contract and the wings to expand and strengthen. It never happened! This butterfly would never fly. It spent the rest of its life crawling around with a swollen body and shriveled wings. What the man did not realize is that the butterfly’s struggle to emerge out of the tightly-fitting cocoon, through the small opening, was necessary to force fluid from the body into the wings, to achieve the proper proportions with a sleek body and strong expanded wings able to support flight. And that struggle unfolds in a proper order, in a methodical and brilliantly designed sequence of things. It is the struggle out of the cocoon that brings about the freedom to fly! Our self-imposed limitations are like the cocoon. The Reticular Activating System and negative defeatist self-talk filter out any evidence contrary to one’s self-imposed limitations. We can freely accept the challenge of a struggle to emerge from the cocoon, using that struggle to purify ourselves from all unwholesome or distorted thinking, from attitudes and notions about life, our own selves, and other people that sap our vitality and end up serving destructive habits of behavior. Or we can maintain the cocoon as a self-imposed prison, to insulate ourselves from the reality of our human challenge. If we stay in the cocoon, we think that this is a protected state but it is instead like being squeezed by a vise, leading to nothing but spiritual ruin. If we try to sneak out of the cocoon without the properly ordered and proportioned struggle, it is likewise nothing but spiritual ruin — like the butterfly with swollen body and shriveled wings. Examples of short-cutting abound in everyday life. Putting on a wise and good-mannered appearance when in public while behaving in a madly intolerant and controlling way at home is trying to sneak out of the cocoon. Speaking to other people in beautiful language of hope and inspiration while habitually ruminating about one’s own fears and doubts is sidestepping the struggle. Comforting oneself that it’s God’s will that one failed the course when the reality is that study got pushed aside time and again for gaming — that’s skipping out on the struggle. There is order and proportion in a genuine struggle for mastery of self. Expecting responsible and good-mannered behavior from family members is good; indulging in a power trip of bullying and intimidation creates psychological and emotional confusion and disturbance. Wanting to uplift other people is good; not practicing what one recommends to other people disorders one’s personal reality with the falseness of pretense. Relaxation and recreation are perfect counterbalance to hard work; putting them ahead of obligation and commitment disproportions one’s activities. Everything must be according to the proper order and proportion in order for us to attain to true health, happiness, and success. “By the soul, and the proportion and order given to it; and its inspiration as to its wrong and its right – truly he succeeds who purifies it, and he fails who corrupts it” (Qur’an 91:7-10). 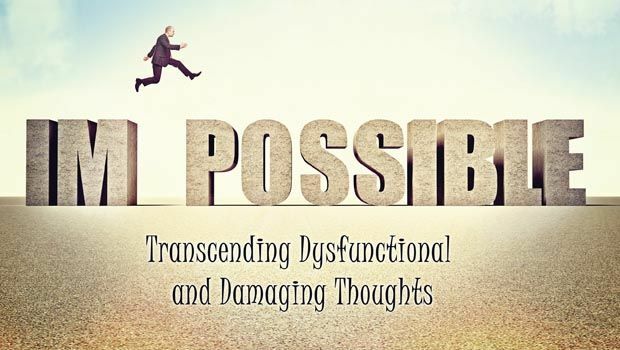 In order to discover any self-limiting beliefs, or dysfunctional and damaging thoughts that cycle through our minds, we can practice a simple yet powerful technique. It brings us greater awareness of our thoughts and provides tools to bring refinement and discipline to the inner chatter. Step one: become aware of your inner dialogue. For one week, catch yourself 3 or 4 times a day in the midst of this chatter. Observe it neutrally and without judging yourself. See if it is supportive of a positive outlook, of your faith, your goals, and your mental and emotional health; see if it supports your efforts to fulfill your greatest potential. Or is it negative and undermining of that? Step two: practice negative-thought stopping. The second week, every time you become aware of negative thoughts which are undermining your determination, STOP that thought with a superior, stronger, healing thought. One can choose anything – an adage, an affirmation, whatever works for you. You can also choose from countless profoundly inspiring and supportive Quranic verses. For example, you can learn in Arabic and /or English “…to Allah we belong and to Him is our return.” This of course comes from the beautiful verses, “O you who believe! Seek help with patient perseverance and prayer. For Allah is with those who patiently persevere……. and give glad tidings to those who patiently persevere – who say when afflicted with calamity ‘to Allah we belong and to Him is our return.’ They are those on whom are blessings from their Lord and mercy. And they are the ones that receive guidance” (2:153-157). If those who are faced with calamity are being prompted to say “to Allah we belong and to Him is our return,” and are assured that they will then receive blessings and mercy and guidance from Allah SWT, then certainly the power of these words, the meaning and hope and comfort, is sufficient to stop a negative and undermining thought. One can also choose from many other verses, such as: “Allah places no burden on any soul greater than he can bear” (2:286); “With every difficulty there is relief” (94:5-6); “Not a leaf falls without His knowledge and permission” (6:59). This is a powerful tool to stop negative inner dialogue so that those counter-productive thoughts do not develop and grow and control us. There was a woman who sought counseling because she engaged in thoughts of disaster whenever her child got sick, or her husband was late in coming from work, or their finances were tight. She learned this technique of thought stopping, using Quranic verses, and within two months she had mastered the technique and no longer was a victim of her negative thoughts. You cannot imagine the positive energy that was released that she could use in productive ways, once she was master rather than slave to her thoughts. Reflect on the profound reality that inner thoughts can become impulses or desires; and impulses can become actions; and actions can become habits. Remember — the practice of writing positive thoughts to replace negative ones strengthens our capacity and our resolve to do that spontaneously whenever we encounter frustration, annoyance, hardship, or any other difficulty in daily living. It is a coping skill that everyone who learns it, comes to love and value tremendously. Step four: Make a resolution to go through one hour or part of a day with no negative inner dialogue. This is not as easy as it sounds, but its rewards are endless. Engaging in positive inner thoughts becomes a virtuous habit, just as negative inner thoughts become a harmful habit. Shaykh Ibn Al-Qayyim makes this significance clear with an analogy. He says that Allah SWT has created the human mind like a millstone which does not stop grinding day or night. Those who habitually produce in their minds positive thoughts, are like those who put wholesome grains in their millstone, and thus produce good flour, to nourish themselves and others. But, he says, most people grind nothing but dirt and stones — meaning negative, harmful thoughts — all day long, day in and day out. When the Trumpet is blown signaling the Day of Judgment, it is time to bake our bread; and then every individual will know what he has been grinding in his millstone: wholesome, nourishing grain or dirt and stones!